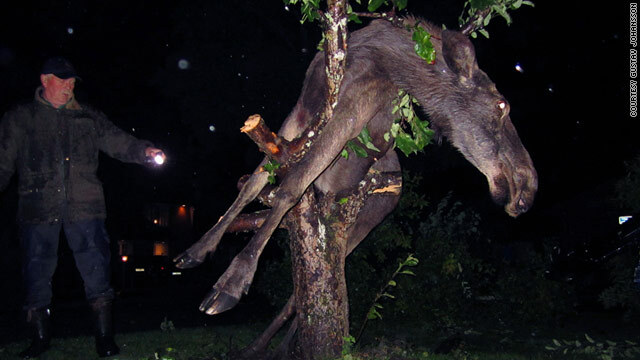 A moose got stuck in a tree after eating fermented apples in Saro, Sweden, Wednesday night. "I saw something really big up in a tree," Per Johansson says, "and it was a moose"
(CNN) -- It was a dark, windy and rainy night when Per Johansson returned from work to his home in Saro just south of Gothenburg, Sweden. "It was raining really bad. In the wind I heard something screaming with a very dark voice," Johansson told CNN. "At first I wondered if it was the crazy neighbors, but then I heard it again and went and checked. I saw something really big up in a tree in my neighbors' yard and it was a moose. It must have been drunk after eating fermented apples and as it was reaching out for more fruit it must have slipped and fallen into the tree." Johansson called the local fire and rescue department, which responded with a fire engine and a jeep with a winch. "We got the alarm at 9.59 p.m. on September 6 that a moose was stuck in a tree," said Anders Gardhagen, spokesman at the Gothenburg Fire and Rescue Services. "When we arrived we used the winch to bend down the apple tree so the moose could get himself out of the tree. Once free, the moose collapsed on the ground and fell asleep. So we let him sleep it off and went back home" Gardhagen told CNN. "Moose are attracted by the apple trees, and in the autumn when the apples have fallen off the trees we normally have at least one of these cases of intoxication. These apples, which ferment in their bellies, aren't part of their natural food, so they can get quite angry from this drunkenness," Gardhagen said. Johansson's son, Gustav, who is about to turn 11, made sure to take lots of pictures of the ordeal. "He is saving up to buy a PlayStation so he thought he would take pictures that he could sell," Johansson said. CNN purchased three of Gustav's pictures. When dawn came the day after it was freed from the tree, the moose had not yet left. "When I went out for the newspaper it was still laying there on the ground, sleeping. By the time I left for work it was walking around the neighbor's yard on very shaky legs." Johansson said. "Today the moose came back and walked around the yard," he added. "I think it likes it here."